I didn’t have a response to that. I have always taught my boys that a sin is a sin is a sin. Not one is different than another. 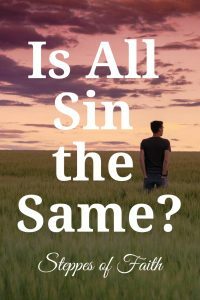 But, now I was wondering—are all sins are the same or are some worse than others? Is failing to use my turn signal as equally sinful as, say, robbing a bank? I dug into God’s word to learn what He has to say about it. Since God is holy and perfect, there can be no sin in His presence. He hates all sin, which means He views all sin with the same weight. Because He is perfect He demands perfection…and that’s where the rub is. We are human, which means we are inherently sinful (no thanks to an evil snake many years ago). A perfect God can only accept perfect people in His perfect, heavenly home. But, let’s be honest, we are all far from perfect. We simply stink at being good, which is why Jesus came to die for us. His death justifies us before the Father so that, as He looks at us, He only sees Jesus’ perfection. If we truly want to be more like Jesus every day then we must follow all the rules and laws. ALL of them. But that’s impossible, isn’t it? Despite our best efforts, we continue to sin whether we know it or not. Thank God for His grace! Without it, we’d be done for, and God knows this. So, does it mean He treats all sin the same way, or does He overlook certain minor ones? The answer is both yes and no. After studying the Scriptures, I have no reason to stop believing that God views all sins the same way. Each one, no matter how minor or major, is flat-out wrong in His eyes. But, I also believe that different sins have different consequences. The consequences of failing to use my turn signal are going to be quite a bit different from someone who committed murder. Willingly breaking a minor traffic law is still breaking the law and killing someone is still murder. Both are sins, but their outcomes are very different. So now, let’s ask ourselves…since failing to use a turn signal, or telling your child a little white lie, or throwing old paint in the trash instead of recycling it all end in minor—if any at all—consequences, is it okay to do those things? The answer to that question is no. It’s a bit stunning when you stop to think about it that so many active Christians think some sins are worth overlooking. I mean, is God really going to kick you out of heaven because you forgot to use your turn signal? I hope not. But, we can’t ignore the fact that a sin is still a sin. Our culture says otherwise. Culture influences us how to think and feel about a wide range of things from extremely sensitive subjects to minor, everyday oopsies. It tells us it’s okay when little foibles happen, that it’s okay to dismiss them. We might argue our society is in moral decline because of it, but that’s not the point. The point is we need to be careful not to look at the world by what culture tells us, but by what God tells us. 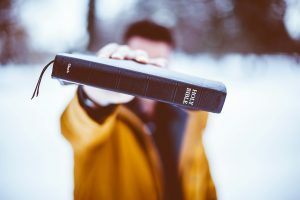 If we believe the Bible is true, then we must believe ALL of it is true, not just the parts we like. And, like it or not, the Bible says that all sin is an abomination before the Lord. All of it is wrong, and none has an excuse, yet we know the consequences for each sin will be different. So, Jesus is confirming that there are varying degrees of sin, right? I don’t think so. Since we know that God hates sin, someone who has committed a very egregious, terrible sin is still the same as a teenager who lies to her mom about cleaning the toilet. So, what does Jesus mean in John 19:11 then? He’s saying there are greater, more serious consequences for greater, more serious sins. In the case of John 19, it was Judas Iscariot who had the “greater sin,” and he paid for it with his life. That consequence is very much different from breaking your promise to clean the toilet. The consequences of sin change according to what you did, but a sin is still a sin. And we know God hates all sin. 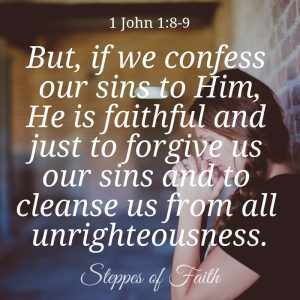 His grace forgives us of our sins after the fact, but we need to prevent sinning from happening in the first place. God is always faithful in every circumstance. He won’t leave you to fight sin all on your own. The Holy Spirit will stay by your side guiding and leading you so you can remain obedient. But, that takes authentic salvation. If your salvation is authentic, then you are actively tapping into God’s strength and wisdom every day so you can be more mindful and put your faith into action. Our holy God views all sin the same way: it’s all bad. So, let’s not discount sin, but always take it very seriously ̶ no matter how big or small it is ̶ remembering the greatest and just consequence for sin is death. I challenge you to examine where your faith is today. Is your salvation authentic? Become more aware of the consequences of your daily actions, both minor and major. Repent from all sin and renew your mind in Christ. Allow the Holy Spirit to walk closely with you throughout your day so you don’t trip up. Remember the Lord is faithful, and He loves you more than anything. He is your friend, a friend to all us sinners. Have you ever compared one kind of sin to another? Have you thought that some are excusable? How does knowing that God hates all sin change your perspective? How has it not? You can leave your comments below, or you can contact me here. I’d love to know your thoughts and beliefs about sin and consequences. 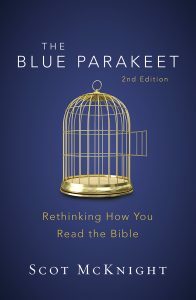 I found an excerpt from The Blue Parakeet by Scot McKnight on the Zondervan Academic blog explaining why Christians need to actively practice discernment so we can authentically live our salvation. You take a peek at it right here. No worries, it’s not an affiliate link. Great article! This is so true even for myself. It’s easy to fall into the trap of “Well sure I lied…BUT I’m not as bad as the murderer over there though”. We like to see ourselves in positive light and look at ourselves as better than others. However even as Christians, the reality is, all of humanity is fallen. We all need a savior. And we thank God for his grace. I’m extremely thankful for God’s grace. I definitely need it every day. I don’t know where I would be without His presence in my life. Thank you so much reading. God bless you! It’s so important to understand that God hates sin. No matter what excuse we try to make, He doesn’t like it. We are so blessed to have God’s Grace in our lives. He’s the only one who know’s our true heart. Thanks for sharing! Thank you for reading, Apryl! Hope you stop by again soon. God bless!